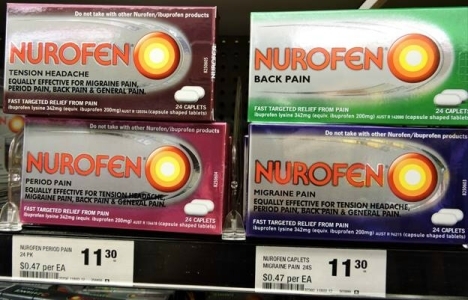 The Federal Court has ordered Reckitt Benckiser (Australia) to pay a civil penalty of $1.7 million for breaching the Australian Consumer Law in its packaging and in its website display of the Nurofen Specific Pain Range. Justice Edelman made the penalty order on 29 April 2016 – his reasons are found in Australian Competition and Consumer Commission v Reckitt Benckiser (Australia) Pty Ltd (No 7)  FCA 424. This article looks at the factors the Court took into account when assessing the penalty. On the front of the packets there was the statement ‘FAST TARGETED RELIEF FROM PAIN’ and on the back ‘…IS FAST AND EFFECTIVE IN THE TEMPORARY RELIEF OF PAIN ASSOCIATED WITH…” (the specific pain condition). The ‘Back Pain’ packet has the old label, while the other 3 have the new labels which have the statement “EQUALLY EFFECTIVE FOR … & GENERAL PAIN” added. On the website, there was a comparator table which indicated that the product in question was particularly effective for a specific pain relief, in more detailed terms than on the packet. The contraventions of the Australian Consumer Law and the non-monetary relief orders are set out in the earlier decision of Australian Competition and Consumer Commission v Reckitt Benckiser (Australia) Pty Ltd (No 4)  FCA 1408 (11 December 2015). the product solely or specifically treats the particular type of pain specified on the packaging relevant to that product and not other types of pain. Each product contained the same active ingredient, namely ibuprofen lysine 342 mg. The temporary relief of pain and/or inflammation associated with headache (including migraine and tension headache), dental pain, period pain, arthritis, aches and pains associated with the common cold or flu, backache, sinus pain, muscular and rheumatic pain. Reduces fever. The Court ordered that the label be changed to correct the misleading impression it gave. Pharmaceutical companies are required to obtain Therapeutic Goods Administration (TGA) approval to their packaging. Reckitt Benckiser had obtained TGA approval for the individual packaging for each product when it was introduced. Now, it had to obtain TGA approval for the ‘range’ to comply with the Court order. The agreement it reached with the TGA was clever – it retained the existing design of the packaging, and added these statements to the front label: “EQUALLY EFFECTIVE FOR … & GENERAL PAIN” underneath the words ‘TENSION HEADACHE’ or ‘MIGRANE PAIN’ or ‘PERIOD PAIN’ or ‘BACK PAIN’; and “Do not take with other Nurofen/ibuprofen products” at the top. Under Section 224(3) of the Australian Consumer Law, the maximum civil pecuniary penalty for each contravention of section 33 by a body corporate is $1.1 million. The Court does not take the number of ‘contraventions’ literally, otherwise there would have been a contravention every time one of the 5.9 million packets of Nurofen Specific Pain Range was sold in the period between 2011 and 2015. The Court determines how many courses of conduct there were. In this case, it found two: one for the packaging contraventions (marketing the range); the other for the website contraventions (a product page and a product comparator page). The Court ordered a penalty of $1,200,000 for the packaging contraventions and $500,000 for the website contraventions. The conduct was not deliberate or covert There was no intentional or reckless contravention of the Australian Consumer Law. 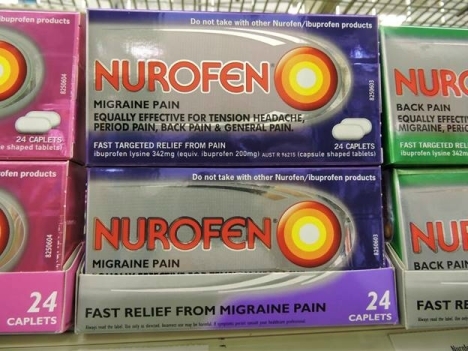 Nature, extent and circumstances of the contravening conduct The Nurofen Specific Pain Range was available at 5,500 pharmacies and an additional 3,000 retail outlets (such as supermarkets) for almost 5 years. The website was ‘live’ for 17 months. Nurofen is a strong brand name and its widespread marketing reached many consumers with little knowledge of pharmaceutical ingredients. The products were effective to treat the pain they were marketed as ‘targeted’ – see the ARTG indications. Sales and profit from contravening conduct, and potential losses to consumers and competitors The fact that the marketing was intended to make a profit from consumers was enough. It was not necessary to calculate (i) profit to Reckitt Benckiser from the contravening conduct, (ii) loss to consumers, or (iii) loss to competitors. It was enough to know that total revenue from sales of the Nurofen Specific Pain Range from 2011 to 2015 was $45 million. The sales represented only a small fraction of Reckitt Benckiser’s total sales and profit. Cooperation with the ACCC Overall, Reckitt Benckiser cooperated with the ACCC. Most substantially, it made admissions of liability early in the trial which avoided litigating a complex, lengthy and difficult case. Compliance programs and the involvement of senior management Reckitt Benckiser had detailed compliance programs, in which senior management were involved. Apart from having no reference to the Australian Consumer Law in these programs, the Reckitt Benckiser compliance team failed to heed what the Court described as ‘warning bells’. They were: (1) an exposé by Choice – a ‘Shonky Award’ for claiming that the products were effective for specific pains in 2010; (2) TGA Complaints Resolution Panel findings that the products did not differ in their ingredients or effects in 2013; and (3) a television show ‘The Checkout’ in 2014 which criticised Reckitt Benckiser for selling the same products that claim to work on specific pain, at a higher price than other products. The Court did not believe Reckitt Benckiser when it said that it was not aware of these ‘warning bells’. Prior contraventions There were no prior contraventions of the Australian Consumer Law for this product and no undertakings for prior conduct, although there was a contravention for an unrelated product. Coles Supermarkets put the packets on the shelf in a ‘shelf ready display tray’. The tray lip hides the additional words “EQUALLY EFFECTIVE FOR … & GENERAL PAIN”. The ACCC asked for a cessation of supply to Coles until this issue was corrected, to which Reckitt Benckiser agreed. The Court said that this issue was not caused by Reckitt Benckiser. Click on the pdf version of this article for a photo of the MIGRANE PAIN packet in a ‘shelf ready display tray’, and above it, a full view of the packet.